Ride on Lawn mowers for sale Newry, County Down, Northern Ireland. We deliver ride on lawn mowers to any county in Ireland - call today on 0044 28 302 66665 - 39 years experience at your service. Ride on Lawn mower Newry, Northern Ireland. We deliver your new ride on lawn mower to any location in Ireland fully assembled no matter how remote, we provide after sales right to your garden. We also offer sales of walk behind petrol lawn mowers. Check out the Warranty tab above, we have been selling lawn mowers of over 39 years, we take that experience directly to your garden, all warranty carried out at your site. If you wish to know a little about us then feel free to have a look. 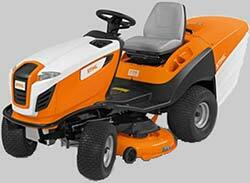 We are stocking Alpina Ride on lawn mowers full details here. We will deliver your new ride-on lawn mower fully assembled to any location In Ireland, no matter how far - fuel costs only, call for a quote. Lawn-King MTD, one of the world's largest manufactures. MTD building lawn mowers since 1958, right to your door. For over 50 years, MTD has been a leader in designing and building durable, easy-to-use outdoor power equipment. Their family of brands offers award-winning products designed to meet lawn and garden needs for both residential and commercial products. MTD Europe manufactures almost all of its lawn tractors at its production location in Germany and as the only German manufacturer with quality "Made in Germany", enjoys an excellent reputation all over the world. Delivery ANYWHERE in Ireland, fuel costs only, call for a quote. Lawn King RE130H from MTD ride on lawn mower, for 2019. Our Price: £1980.00 UK Sterling incl vat. 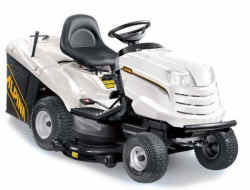 Lawn King LN165H ride on lawn mower, for 2019. More details on Lawn King LN165H MTD. Turning Radius 46cm, solid front axle, padded steering wheel. Our Price: £2550.00 UK Sterling incl vat. MTD Lawn King ride-on lawnmowers, made in EU with delivery to anywhere in Ireland. ALPINA AT584HCB - 33 inch Ride on Lawn mower for 2019 - made by Stiga / Castelgarden. 344cc Briggs & Stratton engine. 33 inch twin blade cutting deck. Our Price: £1890.00 Stg Incl vat. Alpina lawn mowers are a premium brand made by GGP, Italy - we have been selling their brands (Alpina, Stiga and Castelgarden same mower, different colour) for over 25 years. ALPINA AT598HCK - with Kawasaki V-Twin Engine for 2019 - made by Stiga / Castelgarden. New for 2019 now with a 603cc Kawasaki V-Twin engine . 38 inch twin blade cutting deck. Our Price: £2290.00 UK Sterling incl vat. Alpina lawn mowers are a premium brand made by Stiga Group, Italy (Formerly GGP)- we have been selling their brands (Alpina, Stiga and Castelgarden) for over 25 years. Alpina AT7 102 HCB 40 inch Ride on Lawn mower for 2019 - made by Stiga / Castelgarden. Alpina (same mower as Castelgarden - different colour). 500cc 18.5hp Briggs & Stratton Intek engine same as Castelgarden XT190HD. Full Pressurized lubrication with oil filter. 40 inch twin blade cutting deck. 30mm - 90mm cutting height range. Our Price: £2470.00 UK Sterling incl vat ( limited stock). Delivery ANYWHERE in Ireland, call for a quote. Alpina AT8 102 HCB - 40 inch / 22hp Ride on Lawn mower for 2019 - made by Stiga / Castelgarden. 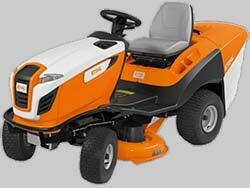 Alpina (same mower as Castelgarden PTX200HD - different colour). 656cc Briggs & Stratton Intek Series 7220 V-Twin cylinder engine. The largest sized chassis from Alpina. Our Price: £2970.00 UK Sterling incl vat. Delivery ANYWHERE in Ireland in our own van, call for a quote. More details on the Stihl RT5097. 500cc Briggs & Stratton engine. 37 inch twin blade cutting deck. Call 028 302 66665 / from ROI 0044 28 302 66665 for BEST price. Stihl RT5112 Z ride on lawn mower, for 2019. More details on the Stihl RT5112. 656cc Briggs & Stratton TWIN CYLINDER engine. 43 inch twin blade cutting deck. Stihl RT6112 ride on lawn mower, for 2019. More details on the Stihl RT6112. Stihl RT6127 ride on lawn mower, for 2019. More details on the Stihl RT6127. 49 inch twin blade cutting deck. 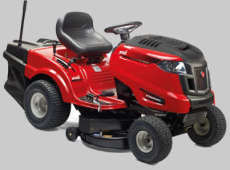 Snapper lawn mowers are owned by Briggs and Stratton USA, they always feature the latest and best Briggs & Stratton engines and like Husqvarna lawn mowers they are built with strength. 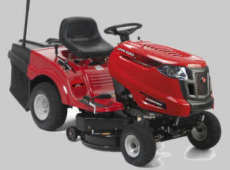 Snapper RPX200 Tractor Ride on Lawn mower, for 2019. Our BREXIT Price: £2650.00 UK Sterling incl vat. 38 inch cut twin blades. Large 18 inch rear tyres / 15 inch front. Mulch kit and tow hitch included. 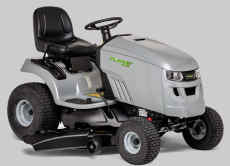 Snapper RXT300 Tractor Ride on Lawn mower, for 2019. 27hp Briggs & Stratton Professional Series 8270 V Twin engine. 350 Litre grass Grass collector - direct chute. 42 inch cut twin blades. Large 22inch rear tyres for better traction. Our BREXIT Price: £3390.00 UK Sterling incl vat. Murray MRD200 Ride on Lawn mower. 22hp Briggs & Stratton Intek Series 7220 V Twin engine. 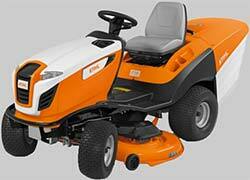 Engine size: 656cc - fitted in most 48inch mowers. Mulching plug and tow hitch included. 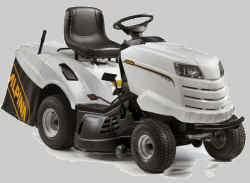 Murray Ride on mower price: £2690.00 Special price. Delivered right to your door, fully checked, fully prepared 38 years experience at your finger tips. 40 inch Honda Ride on lawn mower HF2417 HME for 2019. 300 Litre grass Grass collector - direct chute. 40 inch cut twin blades. Mulching system is integrated, just one lever. Fan assisted bagging, leaves a cleaner cut. Special 2019 price: €3890.00 Euro. Please note that this is the latest model Honda HF2417 with intergrated mulcher. See our Husqvarna Front Deck Rider lawn mowers here, new range coming for 2018. Special 2019 price: £2580.00 inc vat. Special 2019 price: £2760.00 inc vat. New Husqvarna ride-on lawn mowers direct from USA, fully assembled and ready to go, delivery available to anywhere in Ireland. 344cc Briggs and Stratton engine. Manual Transmission - 6 fwd & 1 reverse. All steel panels and bonnet. Husqvarna TC38 price - £1790.00 stg inc vat. Husqvarna TC 130 ride on lawn mower 2019. 344cc Briggs and Stratton engine, pressurized lubrication. Husqvarna TC 138 ride on lawn mower - 2019. 500cc Briggs and Stratton engine, pressurized lubrication. We deliver your new lawn mower to anywhere in Ireland, does not matter how remote, call for a quote - full back up service with 39 years experience. 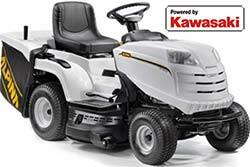 Husqvarna TC 239T ride on lawn mower. Integrated mulching system - operate from the seat. Husqvarna TS 38 ride on lawn mower. 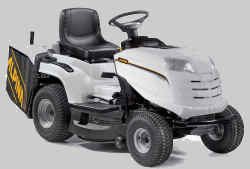 Husqvarna TS38 Price: £1595.00 incl vat. Delivered right to your door, fully checked, fully prepared and with the best back up service, AM Rentals selling lawn mowers since 1980. Husqvarna TS 138 ride on lawn mower. 508cc Briggs and Stratton engine pressurized oil feed. Husqvarna TS138 Price: £1790.00 incl vat. Husqvarna TS 142 ride on lawn mower. 500cc Briggs and Stratton engine pressurized oil feed. Murray MSD200 ride on lawn mower. Briggs & Stratton Intek™ Series 7220 V-Twin OHV engine pressurized oil feed. 46.8 inch cutting deck with 3 cutting blades. Powder coated steel deck - 4 anti scalp wheels. 724cc Briggs and Stratton 8720 Series engine - twin cylinder. 48 inch extra heavy guage steel deck. 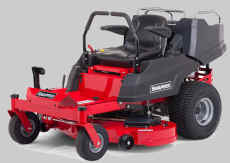 Snapper ZT250 Zero Turn lawn mower. We deliver anywhere in Ireland, fully assembled and prepared, ring or email for quote to your County.